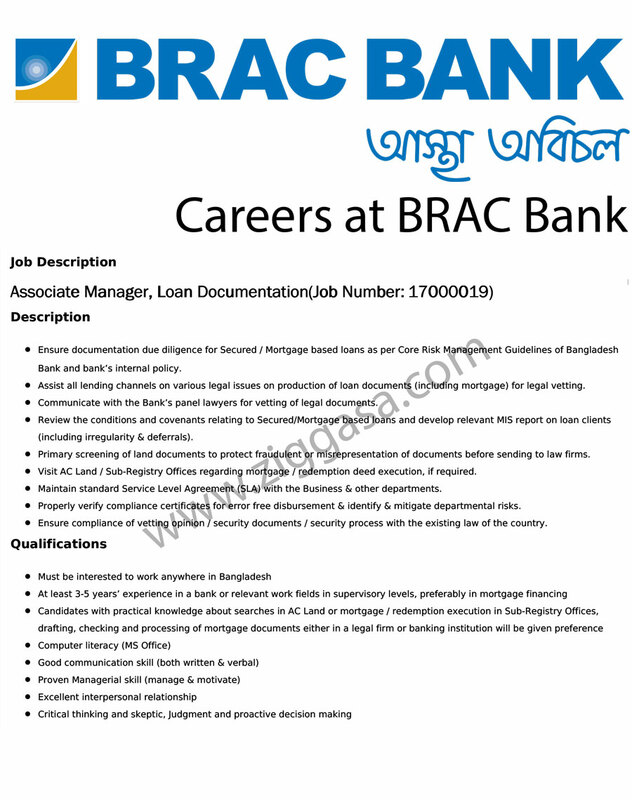 Job Source: BRAC Bank Web Server. Ensure documentation due diligence for Secured / Mortgage based loans as per Core Risk Management Guidelines of Bangladesh Bank and bank’s internal policy. Assist all lending channels on various legal issues on production of loan documents (including mortgage) for legal vetting. Communicate with the Bank’s panel lawyers for vetting of legal documents. Review the conditions and covenants relating to Secured/Mortgage based loans and develop relevant MIS report on loan clients (including irregularity & deferrals). Primary screening of land documents to protect fraudulent or misrepresentation of documents before sending to law firms. Visit AC Land / Sub-Registry Offices regarding mortgage / redemption deed execution, if required. Maintain standard Service Level Agreement (SLA) with the Business & other departments. Properly verify compliance certificates for error free disbursement & identify & mitigate departmental risks. Ensure compliance of vetting opinion / security documents / security process with the existing law of the country.